After an expected lesser campaign in 2016-17 than the season before, and the voluntary separation of the team from Kyle Korver, along with the pending free agency of Paul Millsap, one would surely understand if you believed change was headed the Hawks way this offseason. 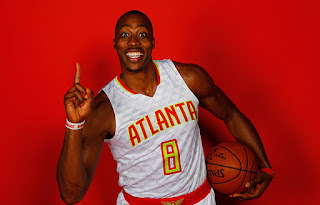 After all, Dwight Howard ended the season on a sad thought, the Hawks could not beat a team maybe best suited for them to upset in the Wizards, and Millsap is on the wrong side, NBA-wise, of 30 years old and looking for an Al Horford type contract, assumedly. My thought? Get used to what you are seeing. Did Tony Dressler make the call to take Paul Millsap off the trading block, a move that would have looked more like trying to build around a younger core of players, in order for them to lose him for nothing this offseason? Is the lesson he says he learned from the Al Horford negotiations one of letting the same thing happen again? Also, has there been anything that Ressler said or done that makes it seem like Dwight Howard, who has a niche group of people that appreciate what he can do on the court these days, would be asked to dissolve his contract, much like the Celtics did with Dominique all those years ago? ESPN was recently bearish on a Millsap return, and he may very well choose a more championship-ready destination, but it will not be because the Hawks left 1M/yr on the table, as they awkwardly did for Horford last summer. I believe they will try to cram the pentagon-shaped block into the Hawks-shaped hole and roll Millsap-Howard out there again. Truth be told, it was never the front court that killed the Hawks this season, it was the awful, dreadful defense of the backcourt that, time after time, submarined the Hawks. True that Howard was left ineffective at the very end of the season, but his numbers were up from his previous season and definitely aided them to their first top 15 in REB% since the 2007-2008 season. Howard was fourth in DEF REB% in the league this season, shoring up a long, long hole in the Hawks center position. Howard holds the team record now for that stat among players eligible for the scoring title and since that stat has been collection. His 31.7% is more than Dikembe Mutombo (31.3%, 1999-2000) and Kevin Willis (30.9%, 1991-92) when they were Hawks. Does that make any great difference? Not in terms of pushing the team higher, but it was a team that traded Jeff Teague for draft pick. Taurean Prince looked really good at the end of the season, but there was some gap in the backcourt that losing Teague and not bringing in any proven productive PG made. Also, Kyle Korver declining and subsequent trade impacted the Hawks by not having the usual amounts of space on the floor, limiting the Hawks offensive efficiencies. Dennis Schröder and Kent Bazemore ended up 189 and 196th in defensive rating, allowing over 105 points per 100 possessions when on the floor. So there was more to it than just an end-of-the-season disgruntled Dwight Howard and it does not sound like the owner has regrets, rather, he sounds led to not make the same mistake happen again as in the Horford scenario. It seems more likely, rather than a complete teardown, that the Hawks attempt to address things that went awry, as in the aforementioned defensive issues and spacing problems in the starting lineup. It is the more likely scenario and one that will help ownership feel better about the gazillions he is paying Howard and Bazemore for next season. It all starts with convincing Millsap to stay, which is the top priority. If he goes, then anything goes, but I would say this is the Plan A for the Atlanta Hawks: Tweak and seek to fill the gaps, keep the stars, and not be a lottery team.